The Slaty-tailed Trogon is a large trogon, 32 cm in length. 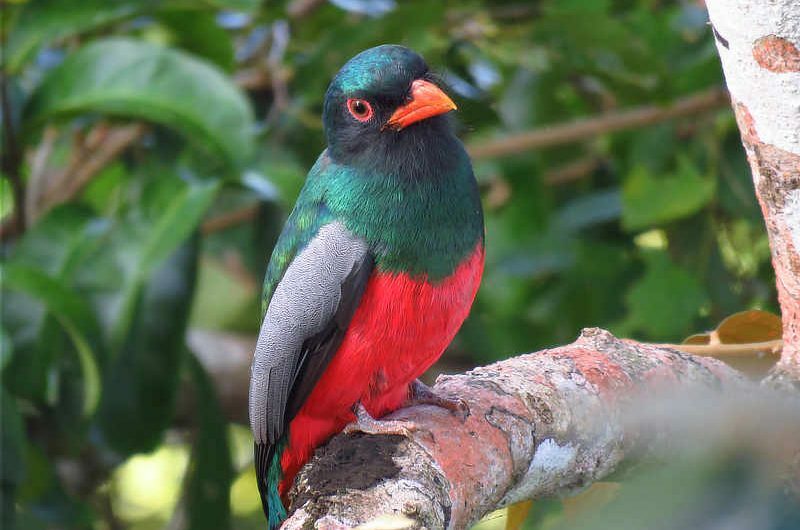 Males are metallic green on their head and chest, dark teal on wings with fine gray vermiculations, a dark tail with no white lines, and is distinguished from other trogons by its orange bill and eye ring. Females are dark gray overall with an orange lower mandible and base of bill. Both sexes have a conspicuous red belly. Slaty-tailed Trogons are common in Panama on both slopes, in lowland and foothills forest up to 1400 meters in elevation. They live in the mid-level and canopy of the forest, regularly come to forest clearings and edges, and also can be found in mangroves. They are usually found singly or in pairs. They sit upright and do not move for often long periods of time, occasionally making sallying flights from their branch to pluck fruits or insects. They even eat small lizards on occasion. Slaty-tailed Trogons have a commensal relationship with foraging White-faced Capuchins, taking advantage of dispersing insects flushed by the monkeys. Although they consume the seeds of plants and fruits, they are not known to be overly effective seed dispersers. Despite the fact that they can be overlooked by their inactivity, they are quite vocal, giving a series of low-pitched clucking “cuh” notes and announcing their presence. In Panama, Slaty-tailed Trogons breed from February to July. Males and females engage in a courtship display which involves bowing, raising of tails and exposing red undertail coverts. Like other trogons, Slaty-tailed Trogons are cavity nesters. They nest in rotting stumps and termitaria, 2-15 meters above the ground. Both sexes work on excavating the nesting cavity with their stout bills, and during their breeding season, it is common to see nesting trogons with dirt on their bill and face. The cavity is a rounded chamber at the end of an upward tube approximately 13 cm long and 9 cm in diameter. The nest chamber is unlined, and has a ridge near the tube to prevent the eggs from rolling out. The female lays 2-3 white to bluish eggs. Both sexes incubate the eggs and rear the young. When chicks hatch, they are fed primarily insects. There is little information known about brood rearing in Slaty-tailed Trogons. The Slaty-tailed Trogon ranges from southern Mexico to northwestern South America. It is commonly seen around the Canopy Tower and Canopy Lodge; at the Canopy Camp, it gets replaced by the similar Black-tailed Trogon, best distinguished from the Slaty-tailed Trogon by its bright yellow bill.